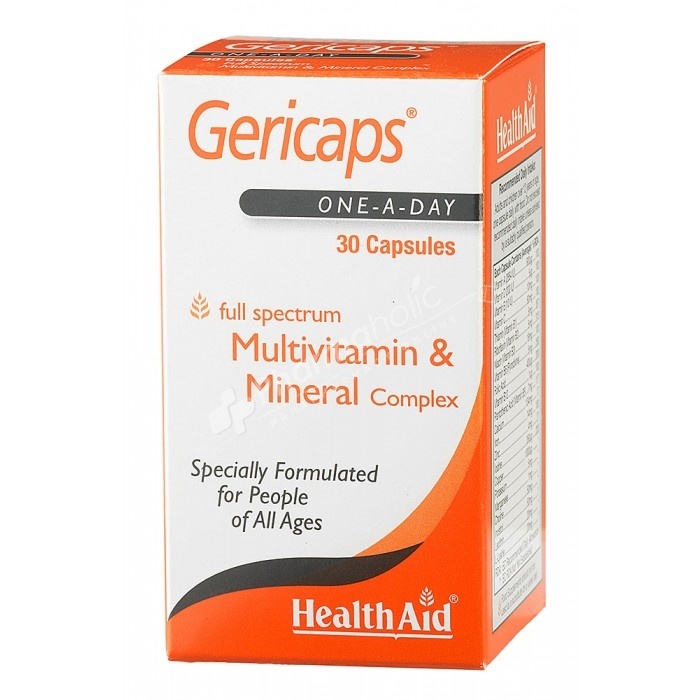 HealthAid Gericaps helps revitalise the body, enable a more active lifestyle, maximise energy levels, and contribute to the reduction of stress and exhaustion from the day to day routine. A highly potent and uniquely balanced combination of natural vitamins, minerals and trace elements. HealthAid Gericaps helps revitalise the body, enable a more active lifestyle, maximise energy levels, and contribute to the reduction of stress and exhaustion from the day to day routine. Adults and children over 16 years of age, one capsule daily with breakfast. Bulking Agent (di-calcium phosphate, soybean oil, vegetable shortening, yellow beeswax), Capsule Shell [gelling agent (gelatine), humectants (glycerol, purified water), natural colours (titanium dioxide, sunset yellow, allura red, brilliant blue)], Choline Bitartrate, Vitamin C (ascorbic acid), Inositol, Iron † (ferrous fumarate), L-Lysine HCl, Emulsifier [lecithin (unbleached)], Niacinamide, Potassium Citrate, D-Calcium Pantothenate, Vitamin E (dl-alpha tocopheryl acetate), Potassium Iodide,Thiamine Mononitrate, Pyridoxine HCl, Riboflavin, Zinc Oxide, Manganese Sulfate, Vitamin A Palmitate, Cupric Sulphate, Magnesium Oxide, Folic Acid, Vitamin D2 (ergocalciferol), Vitamin B12 (cyanocobalamin). Allergen Information: This product contains soya.